"Rock Tracks 3" - Lead Guitar Improvising CD. This CD contains more cool rhythm guitar backing tracks for you to practice your soloing and improvising. These tracks will challenge you to improvise through more advanced key and modal changes as well as solo using exotic scales. Using the Rock Tracks CDs will become an important part of your lead guitar and improvising growth as a musician. 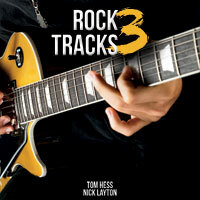 Buy "Rock Tracks 3" now to advance your soloing skills!